D wanted to add salsicce secche to his soup from Tuesday the 2nd, so that was dinner tonight, which finished up the soup. Last time (2 days ago) he served out all of the penne he had added, b/c he didn’t want the leftovers to be all soggy from sitting in the broth for a couple of days. So tonight, in addition to the sausage (which was brick hard, but softened nicely in the soup) he added casarecce. The soup was rich and delicious. He also made a salad; since we had discussed this at lunch, I prepped the lettuce and took the bad bits off the red cabbage while D&R talked about how to choreograph moving/working for the next few days. D made a salad with the romaine and cabbage, plus celery and scallion slices, and a very nice red wine vinegar vinaigrette. 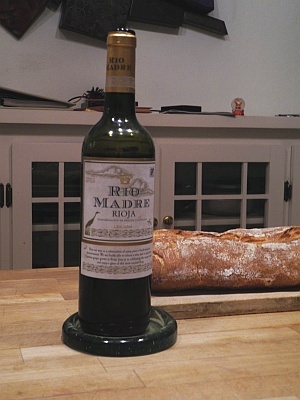 D chose a Rio Madre Rioja from the Bowl that we got as a tester, and it was pretty good. At $11.99, that makes it borderline, but I wouldn’t object to trying another bottle. I think I’d open it earlier, though. Nice flavors. It’s 100% Graciano grape, which apparently is unusual – it’s more commonly a mixer. We ate up the last of the ossau-iraty cheese that I got at Cheese Board before Christmas (then managed not to get there in the 3 days they were open before their January break this week). 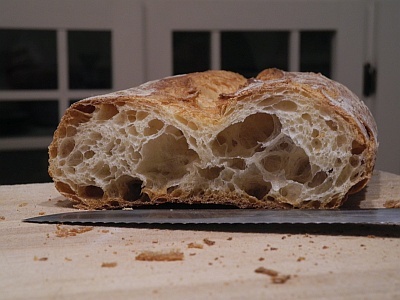 D went to the Bowl on the way back from his dentist appointment, and bought an Acme ciabatta, a tomato – for moisture in sandwiches, regardless of lack of tomato taste – and some white mushrooms, just on principle. We went back and forth about whether to make a salad or what, and he said ok, salad for dinner and I’ll make mushrooms now. He cooked them in butter with **. 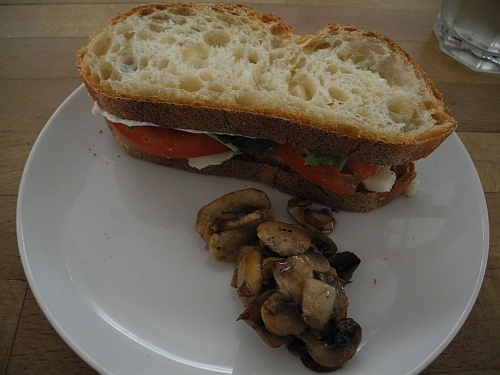 I made sandwiches with the cheese, romaine, tomato slices (S&P’d), thin-sliced sweet onion, mayonnaise, plus mustard on D’s. 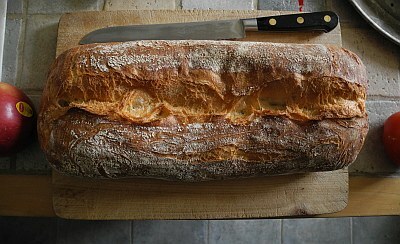 They were really delicious sandwiches. The cheese costs a fortune, but I’d like to get it again sometime anyway. I didn’t notice the price – over $30/lb – when I saw the name for the first time on the pre-packaged shelf at Cheese Board and recognized from the risotto at Piperade – just grabbed it. 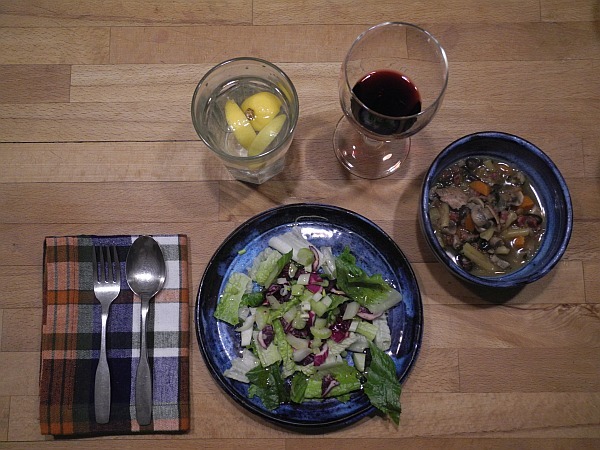 This entry was posted in Beans, Soup and tagged Berkeley Bowl, Cabbage, Celery, Cheese, Graciano, Hard sausage, Leftovers, Mushrooms, romaine, Salad, Sandwich, Sausage, Scallions, Soup. Bookmark the permalink.